Some people are a bit more stubborn and have a need to obtain the last word in an argument or conversation. They have a hard time just letting things go and often need to prove themselves right and silence those around them. 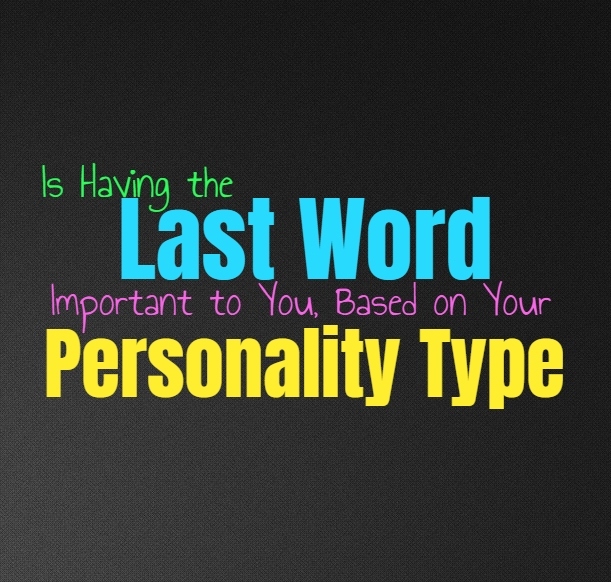 Here is how important having the last word is to each personality type. INFJs do have a stubborn side but they don’t necessarily need to have the last word with everything. They try their best to work through things and don’t want to be someone who always need to maintain the upper hand. At the same time they can be stubborn about certain things, and will have a hard time just letting these arguments go. When there is something the INFJ truly believes in they can become firm, and might strive to obtain the last word. They aren’t this way with everything, and for the most part they can be rather obliging people. ENFJs can sometimes be stubborn especially with things they find important and valuable. If there is something they are focused on the ENFJ can certainly strive to have the last word. At the same time they want to be agreeable and don’t like causing tension when they don’t have to. For the most part they try to make things smooth and don’t want to cause discord. They are often capable of finding ways to have the last word without upsetting people too much, since their goal is often to make others comfortable but they can be stubborn about some things. INFPs are capable of letting things go if it isn’t something which is truly important or valuable to them. They don’t feel the need to always have the last word, but they do with certain things and ideas. When there is something the INFP values and truly believes in, then they can sometimes struggle to really let this go and let others have the last word. They want to express their beliefs clearly and are not afraid of standing up for themselves in these situations. ENFPs do sometimes struggle with wanting to have the last word, since they do have a bit of a stubborn side. When there is something they are truly firm on they often have a hard time just letting this go without trying their best to have the last word. ENFPs sometimes do this simply because they are bored and want to challenge someone else. They can be entertained by things that might seem annoying to others, and so having the last word can be part of a game to the ENFP. INTJs can certainly be headstrong and stubborn people, and so they do struggle with the idea of having the last word. For them it is almost a challenge of being able to spread the truth and not give up on this task. INTJs are strong-willed people and sometimes their desire to argue their point does make them push to have the last word. They cannot simply admit to defeat unless they actually believe that the other person is right, and this takes a lot to prove to the INTJ. They spend so much time researching and learning about things that they are sure about their knowledge and beliefs. ENTJs can be stubborn people and they do work hard to get things right the first time around. They spend a lot of time researching and being sure about things, and so they can be a bit argumentative when people try to challenge their knowledge. ENTJs have a strong desire to win at everything they do, and so this can cause them to want to have the last word with just about everything. They believe in being right and won’t simply back down to someone because they challenge them. INTPs spend a lot of time learning about things and working to develop their opinions and knowledge. They try not to be too stubborn about things but there are times when they can be, especially when they know they are right about something. INTPs do want the last word when they are positive they are right about something, especially when someone continues to try and argue this point. They want to be able to prove this person wrong, since they are fully aware of their own knowledge. This usually happens when the INTP is annoyed by someone and simply wants to show them they are wrong. ENTPs do enjoy debating things, and so they might be a bit obsessed with having the last word. This simply happens because they enjoy being able to debate a topic until someone feels like giving up. They can be a bit headstrong with these situations, especially since they feel like they learn more from really exploring a subject and being able to debate it when a sense of clarity and sureness. ENTPs might want the last word, but if someone else has a much stronger point then they aren’t afraid to change their minds. ISTJs can sometimes be stubborn, especially about something they are sure of. ISTJs are factual people who can become a bit annoyed when someone doesn’t accept their knowledge about things. They do their best to express their information and to make it clear that they know the facts. They can sometimes be focused on having the last word, especially when they know they are right and need to make this clear. ESTJs are rather stubborn people and so they do sometimes find themselves focused on having the last word. They don’t like backing down and sometimes this can make them feel like they have failed. For the ESTJ it is important not to fail, and so they don’t like letting someone else have the last word. They know when they are right about something and so the ESTJ rarely bends in these situations. ISFJs don’t like to be overly argumentative people, and so sometimes they are willing to let others have the last word. They can become very focused on pleasing others and so they don’t want to stir things up or cause problems. ISFJs can be stubborn sometimes, but they don’t like letting this stand in the way of taking care of their loved ones. The ISFJ will try their best to let someone else have the last word if the situation calls for it. ESFJs can be stubborn people sometimes and so they might seek out the last word. When the ESFJ feels frustrated they will certainly want to have the last word, especially when they are arguing with someone. Most of the time they are willing to let things slide since they want to create a sense of harmony, but this isn’t always the case. If the ESFJ can simply move on and let someone else have the last word, they will try their best. When they are simply trying to make things more comfortable for everyone they won’t allow their stubbornness to prevent this. ISTPs don’t really like being stubborn about certain things, since they want to avoid getting into drama. There are some instances where they strive to have the last word, but that is simply because they will express the facts of the situation and walk away. For the ISTP it really isn’t hard to obtain the last word, since they can easily make things clear and move on without obsessing over finishing the argument. ESTPs can be rather stubborn people and so sometimes they strive to have the last word. When they feel like proving themselves right they will certainly want to have the last word. They spend a lot of time researching and learning new information, and so they want to be able to use this knowledge. When the ESTP knows they are right about something they aren’t likely to just give up, and so they certainly fight for the last word. ISFPs don’t usually care about having the last word, unless it is about something they sincerely and deeply value. Most of the time they are more focused on following their own path and so they don’t like arguing with people over pointless things. When there is something they have a strong belief in, they certainly want to express this and won’t be afraid of fighting for the last word. For the most part though ISFPs would rather let things slide, and don’t like really stirring things up. ESFPs can sometimes be stubborn people, and in these instances they might seek out the last word. They don’t like walking away from expressing their beliefs, especially when it comes to something important to them. ESFPs don’t always seek to have the last word though, at least not when it feels like a pointless argument. ESFPs like to have a good time and they don’t want anything to stand in their way of them enjoying the moment and experience joy in their lives.